Different interpretations and reconstruction patterns inspired by the smokkr fragments that were found at Haithabu harbour and analysed by Inga Hägg (1984). Monica Cellio suggests an interpretation where the Haithabu piece would have covered only one sixth of the circumference of the top of the smokkr. By adding gores to the smokkr she increases the flare further. She doesn't mention which pieces should be placed on the front, back and sides of the smokkr, but if Hägg's interpretation should be believed, the original fragment (lower row of Cellio's pattern overview) was at the back or side of the smokkr. The geometrical shapes in the pattern allows for efficient use of fabric and little waste. Vigdis Vestfirzka (SCA) has published a slight variation of Cellio's pattern that allows for easier layout if your fabric isn't the same on both sides. The pattern requires the "Haithabu pieces" to each cover 1/3 of the circumference of the body, while the original fragment was fairly narrow (16 cm). The detailed measuring instructions still make this a good pattern for beginners. Another variation of Cellio's pattern, by Diane S. Dooley, uses one additional body piece, and one gore. The reconstruction by Peter Beatson and Christobel Ferguson suggests significantly fewer pieces when reconstructing the Haithabu smokkr. Beatson and Ferguson puts the piece created by the Haithabu fragments on the right and left sides of the body. This changes the interpretation of the worn out spot near the top of the original fragment. Hägg (1984) believed that the spot was where a loop was attached, but in the Beatson and Ferguson reconstruction it seems more likely to be where the arm and body rubbed together. (The same pattern is also suggested by Carolyn Priest-Dorman). The next reconstruction is presented by Historiska världar, a project run by the Museum of National Antiquities. They say their reconstruction is of a 10th century smokkr, but doesn't set a specific geographic place. I have sorted them under the Haithabu reconstructions, since the smokkr they are presenting is tailored. While the pattern they suggest doesn't contain a piece shaped exactly like the Haithabu fragment, they do refer to the Haithabu find as evidence that the smokkr could be shaped. Lastly, the pattern presented by Nille Glæsel as part of her report on Viking Clothing to the Viking museum in Lofoten, Norway provides yet another interpretation of the Haithabu smokkr. She suggests a simple three-piece smokkr with no gores. Two of the pieces follow the same shape as the original Haithabu fragment. In addition, Glæsel suggests that the smokkr could have been shorter in front than in the back, just like the trailing dresses on the Oseberg tapestry. The three-piece smokkr without gores is also used in the reconstruction at the Historical museum in Olso, although their smokkr seems to have an even length in front and back. Different interpretations and reconstruction patterns inspired by the smokkr fragments that were found at Køstrup and analysed by Wielandt (1980), Rasmussen and Lønborg (1993) and Rimstad (1998). Sara Heil Jensen suggests a pattern (on the right) similar to the one I have used, except with no shaping of the back piece and no extra gores. This results in a layout that uses the fabric very efficiently, while managing to get a side seam where two selvedges meet. A very different alternative is provided by Shelagh Lewins, who has created a reconstruction pattern (on the left) for the Køstrup smokkr that uses short loops for both the front and the back of the smokkr. She argues that the loops found in the graves are always short, as only the area near the metal has been preserved. Thus, while most reconstructions assume that the upper loops were long, the evidence isn't conclusive. The reconstruction she suggests builds directly on the Huldremose dress and other peplos dresses, and just adds the loops. The entire front has been pleated. The suggested front loops are too short to allow for the arrangement with the tablet woven band found at Køstrup, but could be made longer if one wishes. Hägg, I. 1984. Die Textilfunde aus dem Hafen von Haithabu. Berichte über die ausgrabungen in Haithabu, Bericht 20. Neumünster: Karl Wachholz Verlag. ISBN 3 529 1920 8. Shelagh Lewins has made available an English summary of pages 38-42 and 168-170 at http://www.shelaghlewins.com/reenactment/hedeby_apron/hedeby_apron.htm. Rasmussen, L. and Lønborg, B. 1993. Dragtrester i grav ACQ, Køstrup. Fyndske minder, Odense Bys Museer Årbog. ISBN 87 87162 49 0. Rimstad, C. 1998. Vikinger i Uld og Guld, Om de danske vikingetidsdragter baseret på tekstilfunn i grave. Speciale, Forhistorisk Arkæologi, Københavns Universitet. Wielandt, H. 1980. Analyse af textiler fra grav ACQ, OBM3502. Beatson, P. and Ferguson, C. Reconstructing a Viking Hanging Dress from Haithabu. 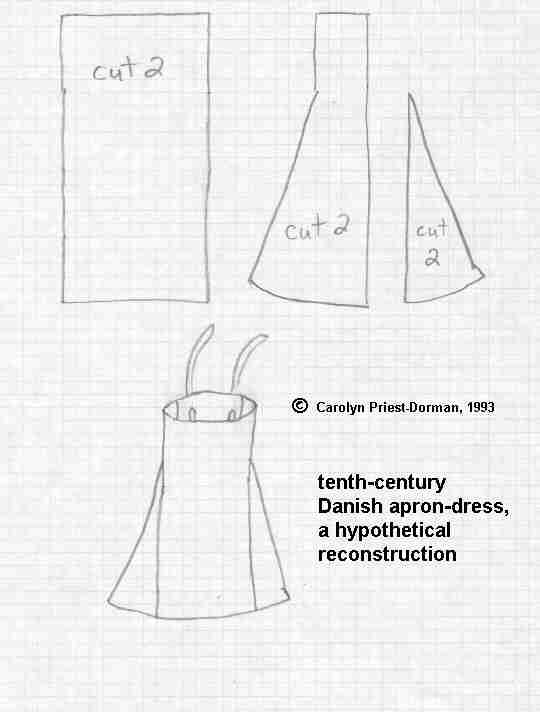 Cellio, M. The Viking Apron-Dress: A New Reconstruction. and Viking - Dress, Clothing, Klær, Garment. Forlaget Nille Glæsel. 2010. ISBN 978-82-998323-0-4.